Human Serum Amyloid A (SAA): biomarker of inflammatory response from tissue injury or trauma. Precursor to AA (inflammatory) amyloidosis. - Advanced ImmunoChemical Inc.Advanced ImmunoChemical Inc.
Home » Assay Notes » Human Serum Amyloid A (SAA): biomarker of inflammatory response from tissue injury or trauma. Precursor to AA (inflammatory) amyloidosis. Human serum amyloid A (SAA) is an acute phase protein that acts as a biomarker of inflammation caused by tissue injury or other traumas. The typical concentration of SAA in human blood in about 1-10 ug/ml, but during inflammation, this concentration rises to levels above 1 mg/ml (1). The primary function of SAA is to recycle and reuse cholesterol in the cell membranes of new cells produced in response to damaged tissue repair and inflammation. Human SAA is useful for studies of AA amyloidogenesis, as it acts as a precursor to AA amyloidosis. Though its role in inflammatory response is widely accepted, more research is warranted to fully understand the role of SAA in the reparation of damaged tissue and its impact on HDL as a source of reverse cholesterol transport (2). 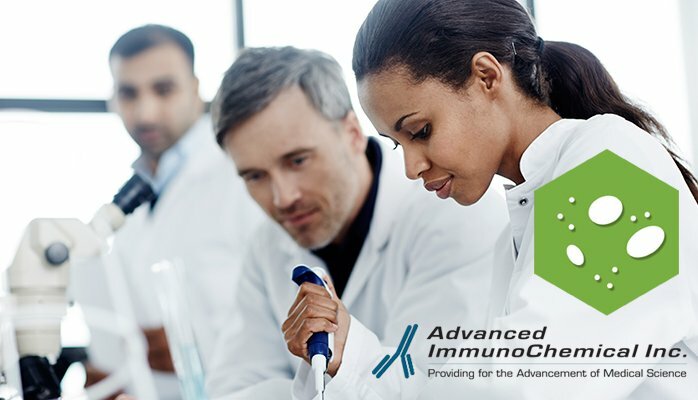 Advanced ImmunoChemical offers eight monoclonal antibodies specific to human serum amyloid A (SAA). The MAbs can be measured in plasma by sandwich immunoassay, as well as immunodetection by Western blotting. All of the antibodies have shown to correctly identify the human isoform SAA1 as well as endogenous SAA. Increased levels of SAA are associated with various inflammatory diseases, autoimmune diseases, viral infections, and secondary amyloidosis. Secondary amyloidosis is often linked with diseases such as rheumatoid arthritis and tuberculosis, causing SAA to be a valuable indicator of these diseases (3). In addition, the levels of SAA can be used as a predictor of the rejection of acute renal allografts in renal transplant patients (4). Measuring the concentration levels of SAA in the blood can give rise to the ability to diagnostically predict inflammatory responses and effectively modify inflammatory treatments. (1) Artl, A. et al. (2000). Role of serum amyloid A during metabolism of acute-phase HDL by macrophages. Arterioscler Thromb Vasc Biol, 20(3), 763-772. (2) Kisilevsky, R., & Manley, P.N. (2012). Acute-phase serum amyloid A: perspectives on its physiological and pathological roles. Amyloid, 19(1), 5-14. (3) Nakayama, T. et al. (1993). Monitoring both serum amyloid protein A and C-reactive protein as inflammatory markers in infectious diseases. Clin Chem 39(2), 293-297. (4) Maury, C. P. et al. (1984). Measurement of serum amyloid A protein concentrations as test of renal allograft rejection in patients with initially non-functioning grafts. British Medical Journal (Clin Res Ed), 288(6414): 360-361.